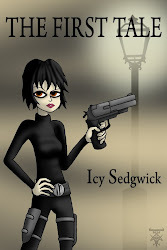 Icy's Blunt Pencil: E-Book Release! It's finally here!!!!! 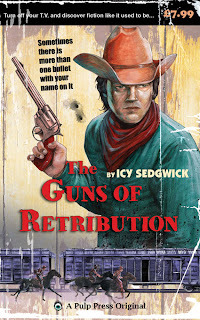 My pulp Western, The Guns of Retribution, comes out in paperback on September 24 but if you can't wait that long, click here to purchase your Kindle copy in the UK, or here for the US. It's 99p for a limited period (it says it's £1.14 due to the fact that e-books are subject to VAT), and then it'll go up to £1.99. I would love to know what everyone thinks! The search for a murderous outlaw has brought the long roving Gray O’Donnell near to his hometown of Retribution, Arizona. Bounty hunters ain’t popular but old fashioned manners, kindness to regular folk and a face for the ladies make Gray an exception round these parts; and a six gun’ll take care of the rest. Anyway, Gray has a job to do elsewhere. 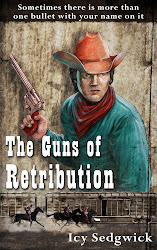 But the odious Jasper Roberts has made himself Sheriff of Retribution and he has a score to settle with Gray. Jasper ain’t gonna let morals or the law get in the way of a good hanging and the townsfolk are cowed by their villainous lawman. Can you really mess with a man’s momma and get away with it? Sometimes there is more than one bullet with your name on it. I'll be starting a series of blog posts about the book in the run up to the release of the paperback but if you have any questions, fire away! Congratulations! I'll get it now. Great work Icy, I'd love to get the paperback, is it going to be in wider distribution, via this site only? ( I use The Book Depository a lot http://www.bookdepository.co.uk) Well done! Wonderful! The cover is stylish, and the blurb is enticing. Is it going to other stores like Smashwords, too? Congrats, Icy. I already picked up my copy, and I look forward to reading it. That's super awesome news. I'm loving the old school cover, that's definitely going to stand out on the Kindle Store. Justyn and David - I'm not sure about wider distribution but I am in the process of finding out for you! I hope everyone enjoys their copy! Got me a copy and looking forward to reading it. Congrats, Icy. St. Terrific! Very well done :) The cover looks just amazing. I'll be holding out for a paperback ... any advice for your Australian contingent or shall we just get Amazon to ship it out to us?